The college has conducted several training programmes customised to the identified needs of health service personnel of different states, young health researchers, physicians in practice and national health programme managers and consultants. Large scale training have been organised in areas of core focus like - diabetes, epidemiology, Health promotion, mental health etc. Strengthening health systems is a major priority for improving the overall systems performance across managerial, academic and technological domain. These training are intended for key personnel in health systems to build their capacities in effectively leading on and managing complex public health programs. The training division at PHFI builds capacity of health systems personnel at various critical levels including both managerial and thematic capacity. Health systems training at PHFI has included training on program management and evaluation, health policy analysis, ICT in public health, data management, decision making and leadership among other areas. The college has conducted training on improving cancer control, disaster preparedness, neuro development among children, evidence based management of diabetes, tobacco control and cardiovascular diseases. Additionally, the college has also conducted training on sub-themes like disability, hearing impairment, rapid response and adolescent health. Special training programs are introduced in the course so as to give students a basic knowledge about some of the infectious diseases. Trainees have included personnel from government and non-government backgrounds - including NGOs. They are so good at their work that all the students who took this training got 100% credits in their programme. The Public Health Foundation of India laid established its first institute in Hyderabad in the year 2007 in partnership with the Govt. of Andhra Pradesh. IIPH Hyderabad commenced its activities from 2008, with a mission to convey public health education, research and support policy development. IIPH Hyderabad's intends to train the public health professionals through long & short-term courses. 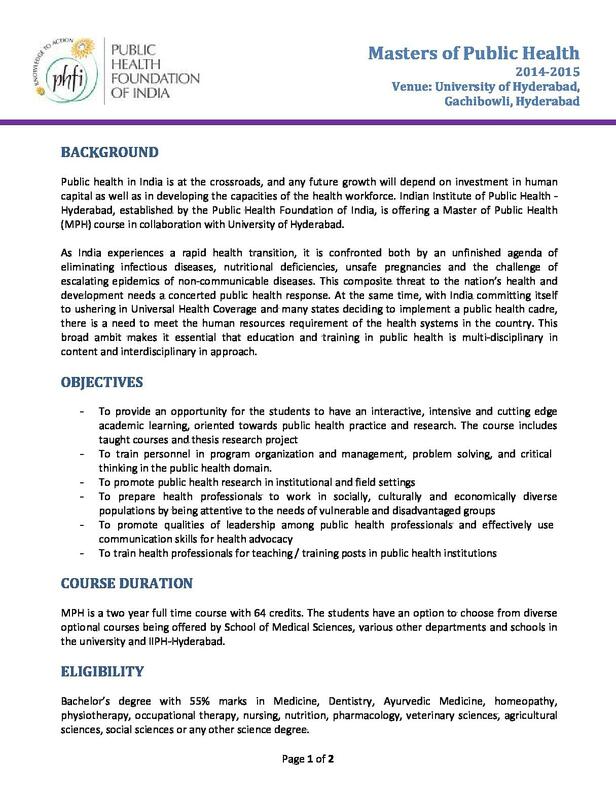 Presently IIPH Hyderabad offers with Post Graduate Diploma in Public Health Management, Masters of Public Health, Integrated M. Sc & PhD in Health Informatics and several Short-term courses. The institute has a highly qualified& diverse faculty and also brings in some of nationally & internationally trained and experienced public health academics and practitioners. ï»¿The institute provides scholarship to the applicants under the MMTC Scholarship Fund. The institute provides with this scholarship to the students who selected and enroll for the PGDPHM program offered by the institute. 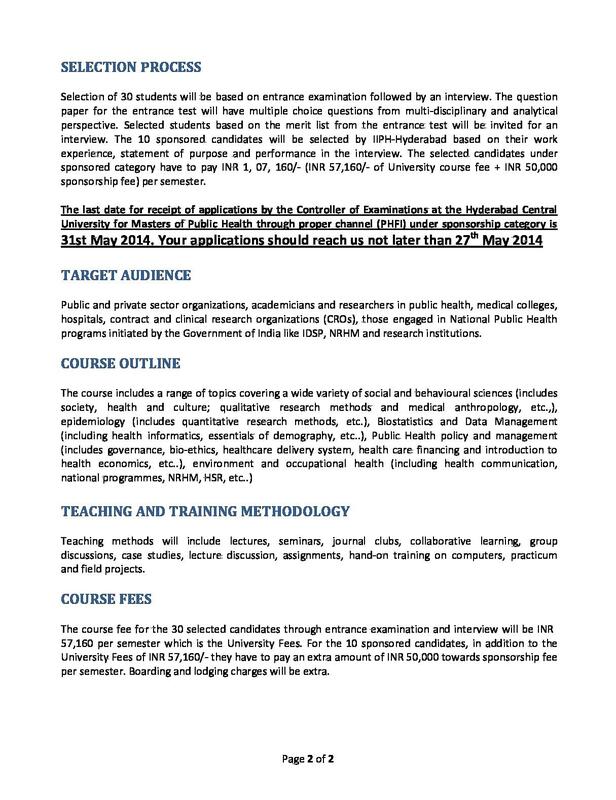 At IIPH Hyderabad a number of researches, training programs and workshops on the subjects related to the public health takes place in which number of working professionals and students takes part. From all these activities the students of the institute gets wider exposure to the various subjects and aspects which are related to the public health concern. The IIPH Hyderabad institute collaborates with various researches, academic, and administrative organizations to carry out various workshops and conferences in the institute and to undertake the public health research & evaluation. The institute has collaboration with the Govt. of Karnataka for the technical support for PGGPHM program offer by it. Entrance exam is conducted by the college every year so that interested students can apply and take admission in the college. The whole admission process is quite easy and the academic office people would help you along the way. You will need to have 50% marks in your graduation to be able to apply for this course. Work experience is also given preference. Bachelor Degree with at least 50% in any discipline from recognized University by the University Grants Commission and the Degree awarding University must be member if Association of Indian Universities. There is no age restriction to apply for the course Masters in Public Health. Both men and women candidates are given equal preference and are eligible to apply for the course. 50% marks in graduation are required to be eligible to apply in this course in this college. The percentage will be calculated from the total marks of 1st, 2nd & 3rd year under 10+2+3 scheme including languages and other subjects. The admission criteria is simple and easy to understand. My parents were supportive throughout the admission process and were very happy.